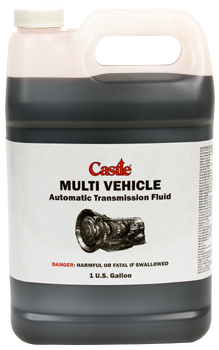 Castle® Multi Vehicle Automatic Transmission Fluid is suitable for use in today’s hard-working transmissions, as well as older vehicles, including North American, Asian, and European brands. 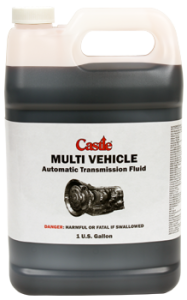 Multi Vehicle ATF provides superior anti wear protection, oxidation resistance, and sludge and varnish control. With built in anti-shudder control. Fortified with advanced corrosion inhibitors, enhanced foam-preventing properties, as well as seal protection. See compatibility chart for specific vehicle applications.